Ensure that the title contains some actual words, and not only $\LaTeX$ -- the search functionality of MSE does not interact well with typeset mathematics, making questions comprising only $\LaTeX$ (much) harder to find. Furthermore, the MathJax context menu (which pops up when you right-click on some typeset expression) overrides the browser's link context menu, making e.g. opening the question in a new tab difficult. I this policy still in force? Where are users supposed to find answers to such questions? I'll put it this way: this is still a good idea. Makes it easier for folks to do the right-click -> new tab maneuver. Makes titles easier to understand. Makes them more mobile-friendly: the page width is smaller there, and formulas don't linebreak as gracefully as text. Finally, having some text in titles makes them look less like gobbledygook to Google; I suspect Google may distrust the pages whose titles consist of random gobbledygook. It seems to me MSE policy is to start the title of a question, as often as possible, with an upper case letter. Is it so? I'd much rather see titles begin with an uppercase letter whether or not it's a complete sentence or ends with a period. All-lowercase titles look lazy. Title case makes perfect sense in principle, but on the Internet I find sentence-case titles easier to look at, especially when long. I saw enough of Twelve Amazing Tricks To Present Page Titles In Most Trashy Way Possible. Also, compare with arXiv (below). 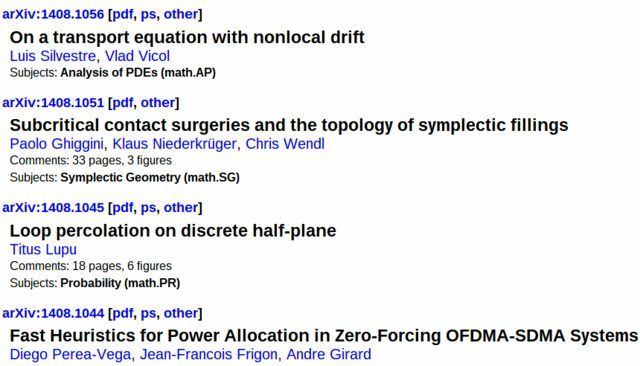 Sure, arXiv is not a Q&A site, but the comparison makes sense because in both places we have titles ordered in a long list on a page, with somewhat similar page layout.